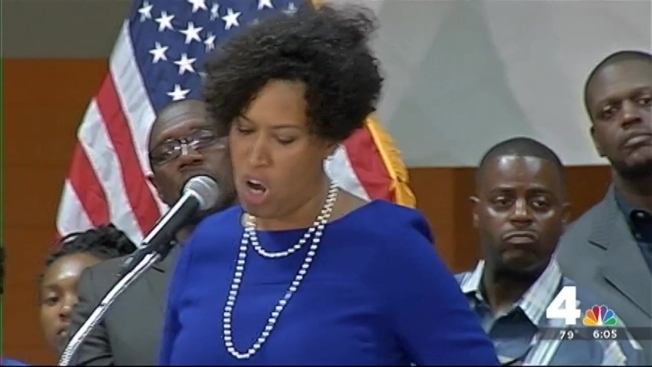 Protesters who interrupted District of Columbia Mayor Muriel Bowser's announcement of her crime-fighting platform say increasing police powers won't reduce violence and the mayor is only paying superficial attention to their concerns. The mayor officially announced more police will be on the streets and that she's seeking about $15 million in new community initiatives to curb violence. Bowser, a Democrat, was repeatedly heckled and booed by a few dozen protesters with the Black Lives Matter movement during her announcement Thursday in southeast Washington. The activists were particularly upset about a proposal to search the homes of violent offenders on parole and probation. Bowser says people convicted of gun crimes shouldn't have illegal guns. But protesters say searches would put innocent people at risk. The district has experienced an increase in violent crime, with almost as many homicides so far this year as in all of 2014. "We are nowhere near the bad old days of the '90s and we're not going back there, either," the mayor said to the mostly supportive audience. Police Chief Cathy Lanier says most residents want more officers on the street.